7-11004 NASCAR Ready-To-Run train set. The thrill of NASCAR, Americas fastest growing sport, is captured in this new, O gauge train set from Lionel. Designed for NASCAR fans everywhere, Lionel has created a set inspired by the excitement and spectacle of their favorite sport. This set boasts a train as dazzling as any NASCAR vehicle, complete with a colorfully decorated diesel engine, a single-dome tank car, a boxcar with the champions trophy, and a caboose like youve never seen before! Whats more, fans can add to the core set by getting one of six expansion packs, each featuring one of the top legends of the sport: Dale Earnhardt Sr.
Jeff Gordon, Jimmie Johnson, Kasey Kahne, and 2005 Nextel Cup Champion Tony Stewart! Who better than Lionel to haul the NASCAR race-week experience into homes across the country? GP38 diesel locomotive, single dome tank car, boxcar, flatcar with billboards, caboose, three straight FasTrack sections, eight curved FasTrack sections, a FasTrack terminal section, powerful Lionel transformer. Transformer controlled forward, neutral, and reverse operation. TrainSounds sound system with diesel engine revving, horn, bell squealing brakes, and operator-controlled, multi-part crew dialog. Dimensions: Length: 53 Layout dimensions: 40 x 60. 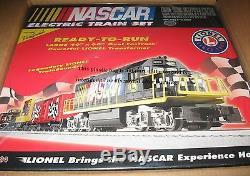 The item "Lionel New 7-11004 NASCAR Ready-To-Run train set" is in sale since Saturday, April 28, 2018. This item is in the category "Toys & Hobbies\Model Railroads & Trains\O Scale\Other O Scale". The seller is "partsandtrains" and is located in Plymouth, Michigan. This item can be shipped to United States.